During the middle of the nineteenth century, like most of the country, New York was a horse powered city. Given New York's density, the horses' impact on the city was, more than anything, smelled. It has even been said that sailors as far a six miles at sea could smell the city. Furthermore, like every other animal on the planet, horses often died within the city limits leaving hundred pound carcasses along side the road. It is estimated that fifteen-thousand horses died each year in the city, leaving lots of horse material to clean up. So what happened to all of the dead horses? On the outskirts of the city, just before arriving to Jamaica Bay, rendering facilities were established to process all of the dead horses. This horse rendering area is how Dead Horse Bay received it's name. Located across from Floyd Bennett Field is the location of the former horse rendering facilities from the middle of the nineteenth century. What remains of these facilities is now just the wooden foundation. Following the horse rendering facilities, the area began to be transformed into a landfill during the early part of the twentieth century. The landfill existed for dozens of years until the 1950's when it was finally closed. 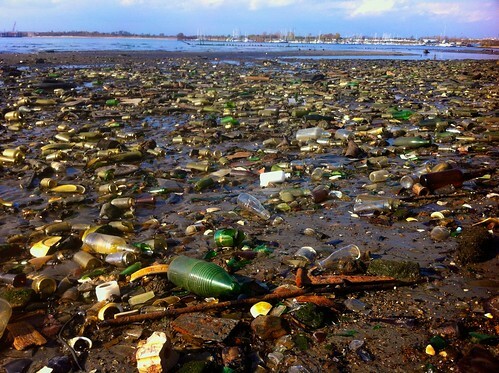 Despite is closure and capping, the landfill began and has continued to pour it's waste onto the surrounding beaches. The majority of this was consists of glass bottles and leather shoe soles though plastic toys are often found on the beach. To learn more about this site, a small group of trash enthusiasts set out to visit the area and document the shores using kite photography techniques developed by the Public Lab. 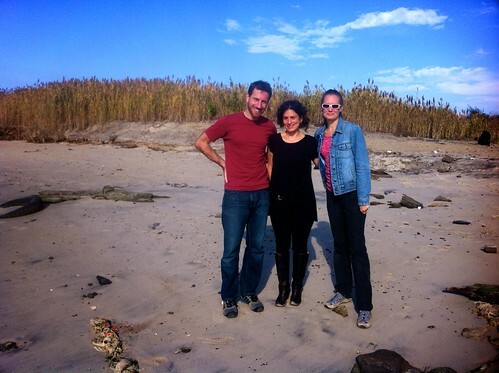 Our group boarded a public bus near Brooklyn college and traveled towards the Rockaways. Along this route lies a marina which sits adjacent to Dead Horse Bay. This is where we began our journey on foot. 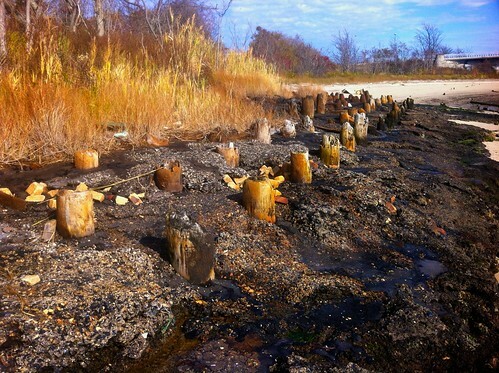 Arriving on the beach, close to Marine Parkway Bridge, we discovered the early foundations of the factories which handled the dead horses. The sense of awe and wonder created by reflecting on the past quickly passed as a fowl smell filled the air. The smell was unrecognizable. Similar to burnt plastic but something quite different. A smell so strong that after only a few minutes our group decided to move onward to avoid illness. Continuing along the shore, the number of glass bottles was astounding. Many of the bottles still in tact with varying colors, qualities, mold and designs. The beach was completely covered with glass, mostly broken glass creating a unexpectedly dangerous environment. One slip and what would be a soft fall onto sand would instead be an almost certain landing on a sharp piece of colored glass. 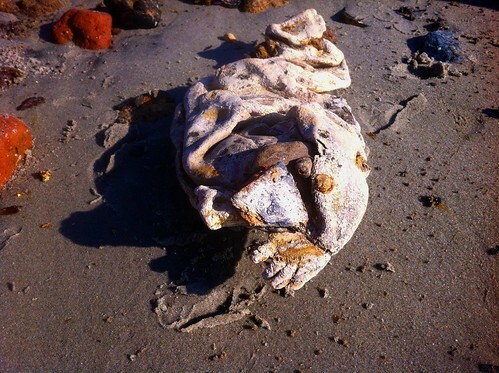 One of the most surprising and stomach-churning findings of the day was a plastic baby doll that had been compacted and seemingly melted into a massive pile of goo. The only recognizable piece of the doll was a protruding hand covered in moss. Littered amongst the glass was also countless leather soles from old shoes. We also uncovered the leather sheets that were used to stamp out the soles. While walking down the beach it was clear from where all of this waste was coming. Above the beach, where the landfill once existed, the land was being eroded away by the water. As this erosion took place, one could easily see the debris spilling onto the beach. Upon further inspection, one could also see the varying layers of waste that made up the landfill. Though the majority of the waste was made up of glass bottles, there were also a great number of car parts and large metal machinery which lay on the beach rusting. Rubber tires were spread throughout usually half buried in the sand. 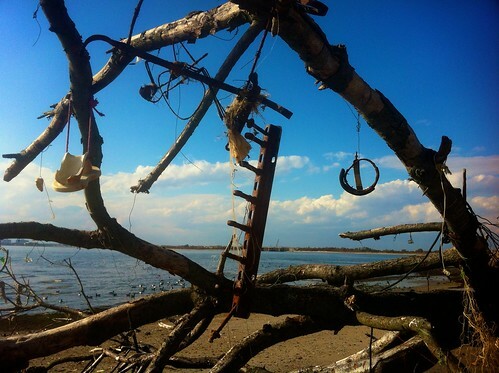 Indeed, this beach seemed as the remnants of the apocalypse. Our presence on the beach was also clearly not unique. Often people sort through the ancient waste in search of something of value. A passerby explained that often people search for old dentures with gold fillings as a source of profit. Fortunately (or unfortunately), we did not find any dentures. Other structures found in the fallen trees resembles an artists attempt to gather their findings a construct some emotional sculpture for all to see. Our goal for the day was to document the area from above and create a map for future use. In preparation for this, we brought two kites and a camera rig made up of a plastic bottle and an old iPod touch which would use an app to take photographs every ten seconds. As we assembled our aerial kit, we struggled to determine if the wind would be in our favor. After many attempts, there was enough wind to only barely sustain our kite in the air. Though we could sustain the kite in the air, we had not enough space to really gain altitude and document from above. Our kit continually drifted to the right undermining our efforts to capture imagery. Overwhelmed by the day, we made our way back towards the marina to catch the next bus home.